The BaySail program is gearing up for the spring 2011 season, and offering nine fully funded scholarships. The scholarships will go to fund environmental education programs for seventh grade classrooms in Bay, Saginaw and Midland counties. The program is called Science Under Sail. 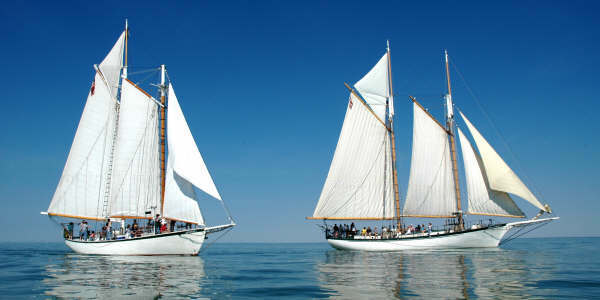 It features hands-on science lessons aboard two Appledore schooners operated by BaySail, a nonprofit located in Bay City. Scholarship applications are being taken through March 25th. The trips will be paid for by the Dow Corning Donor Advised Fund. Interested teachers need to submit a short scholarship application and a letter of support from a school administrator. The Science Under Sail program focuses on water quality and ecosystem health. Students aboard the schooners analyze water, sediment and plankton samples that they collect while the ships are underway. You can find out more information on the program online at baysailbaycity.org. Car shoppers and car dealers, take note. If you’re shopping for, or selling a used car, you need to know about an EPA program for window stickers. Usually, fuel economy stickers only appear on new cars or trucks. But the EPA is now offering fuel information for used vehicles, in a window sticker format. The fuel economy ratings for older cars go back to 1984. The EPA is encouraging car dealers to use the new labels. The fuel economy numbers are for older model vehicles, but the EPA has applied updates to the numbers based on a new estimating method from 2008. You find the used car fuel economy labels online at fueleconomy. gov. There’s a new study out on the economic benefits of restoring the Great Lakes in Michigan. The bottom line: The benefits far exceed the costs. The study, done by economists at Grand Valley State University, looked at a $10 million federal project to restore the shoreline of Muskegon Lake. They concluded that $10 million spent to restore fish and wildlife habitat along several miles of the lake increased the collective value of nearby homes by $12 million. That same $10 million investment also upped the lake’s recreational value by $2.5 million. Added together, that’s $15 million of value for $10 million. Not a bad investment, the economists say. The cost-benefit analysis also doesn’t include other positives, like jobs created by restoration projects. Funding for Great Lakes restoration is due to drop this year. A total of $475 million was provided last year, under the Great Lakes Restoration Initiative. This year’s funding could drop to $225 million. The measure is still being debated in Congress.